Why YOU should consider attending an Improvisation course at Jackdaws!!!!!!! Improvisation at the piano, what does it feel like? Actually, do we feel improvisation in the same way we experience inspiration? Or do we improvise based on what we already know? For example fit this chord to that scale and vice versa. Those are all reasonable questions. But, reasonable or not, as questions go they share an important quality in that they don’t fall cleanly into the bins of either yes or no. Hence, in an upcoming course on improvisation at Jackdaws we’ll explore the process, the experience, and the feel of improvisation. We’ll look to link inspiration and improvisation. Contact and then contract with Jackdaws. Reserve one of those open seats. How does one practice improvisation? How can we learn to improvise? How do we know if whatever it is that we’re improvising is worth even playing in the first place? The answer to the last question is always yes. That’s because we want, first and foremost, the experience. From that we can draw the lesson(s). 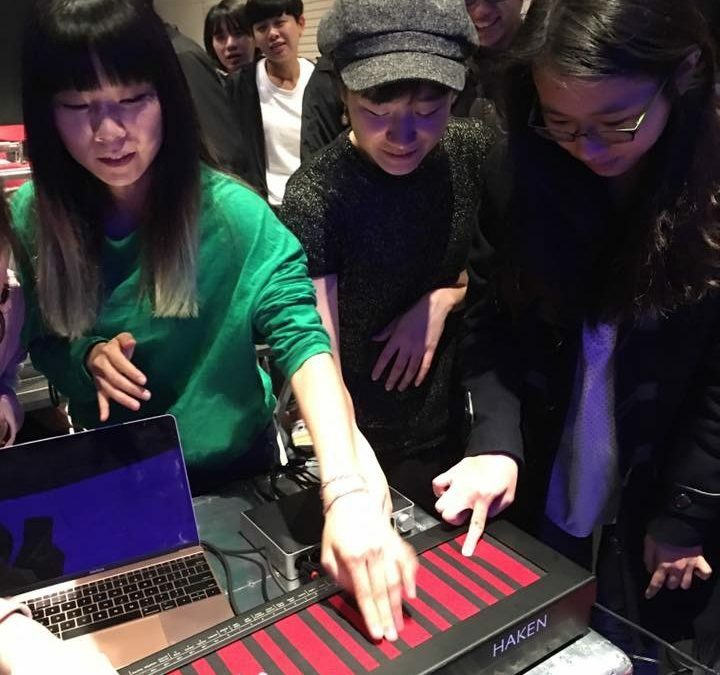 The pic at the top of this post … It’s a university music programs in Taipei in Taiwan where students were trying out my Haken Continuum. It’s fascinating instrument—it looks like it has a keyboard but, actually, it doesn’t. There are the black stripes that represent black keys. And the red stripes that represent white keys. But without a traditional keyboard with raised black notes the Continuum is a non-traditional instrument, one that plays according to touch and feel along an otherwise featureless surface. It’s a space where improvisation, inspiration, and imagination—they mingle. That’s because the Continuum can’t be played like a piano, an organ, or a harpsichord. So, yes, it shows us a traditional keyboard. But, no, it does’t let us manuervre on a traditional keyboard. Ina book excellently and insightfully written by John Pitts, improvisation is process, a thing, as it were, that we learn and thus do across time. Something I’m saying more and more, a phrase from Harold Danko, sums it up perfectly. We improvise to learn. We don’t learn to improvise. Clearly, this post has been circling around those words. Here’s an interview in which Harold said them. But how does one learn to improvise? How do we improvise to learn? Who could have known that focus on so-called right notes eventually would lead someone to the so-called avoid-notes—very simply, the notes one should avoid when improvising (in certain contexts, let it be said). I’m definitely not the first one to notice something is awry in how improvisation is taught, or, rather, how it’s sometimes taught or can be taught. Here, I mean awry as in the existence of entities like avoid-notes? Really? Is an avoid-note a, is it a thing? The post behind that link criticises how improvisation often was and still is taught. It’s worth the time it takes to read it. It’s also a wonderful example of constructive criticism in the best sense of the word. That is, it explains a problem, clearly, and, it proposes a solution. Clearly. To be fair, I’m not sure the presentation of the solution is as clear as that of the problem. Regardless, it’s an insightfully written post. The feel or the knowledge? If we know what something FEELS like then it’s often easy to do. Is that fair to say? But how do we get experience doing something we may never have done before? How do we know how to even begin doing that thing, whatever it might be, with which we haven’t yet had the experience of doing? We’re not going to acquire new experience if we continue to do things as we’ve always done them. Drive forward but look in the rear view mirror, etc. That’s not unlike thinking about one year of experience acquired thirty times, on the one hand, and thirty years of experience acquired once? So the question is how do we get to the one thirty-year track, that rather than the one road traversed thirty times over thirty years? 30 x 1 and 1 x 30. So, 30 is common to both equations. But, the notion of 30 x 1, that, rather than the experience of 1 X 30—30 x 1 is the better choice I would think. 1 x 30 and there are the few open seats, end of October, in the improvisation course at Jackdaws. There’s a right way to learn how to improvise. There’s a wrong way to learn how to improvise. There’s also a way to learn what improvisation FEELS like. And, of course, sound, is the essential component with which we work with when we improvise at the piano, or at any instrument, for that matter. Sound, sound, sound. Can we say and think and experience it enough? It’s the essential ingredient in musical space? THAT—that there’s a way to learn—is what the Jackdaws course will cover. It’s a question of acquiring experience, however uniquely we all may have to do so. But that’s also the beauty of improvisation which is, we can all acquire our own way of doing it in some way that’s uniquely our own. Here’s a summary of course content. While I describe each of the following topics as a law, that’s only because, well, to describe principles as laws is a way to emphasise the irony, metaphor, and allegory in and amongst most principles with which we work. In other words, we’ll use words to discuss skills. But the skills don’t consist nor are they contained within the words we use. Rather, the skills are what we acquire when we do our best to animate the principles which which we work. Of course, that can be slippery. It’s not always clear nor even lambent! But it comes down to use the laws we have to generate the experience we need. It’s a process in which we’ll discover, in good time, how to move forward. And so on. The law of 1 x 30. The law of improvising to learn. The law of the shortest way. The law of notes of possibility. The Jackdaws improvisation course run from 26 through to 28 October. A lot of fun will be had along with learning. That’s because fun and learning go together—one presupposes the other? For course registration details and all related things, please visit the Jackdaws website. Or, contact me directly with questions about course content and/ord how we’ll go about observing our so-called laws. Maybe better to say, with Harold Danko’s words, that we’ll improvise to learn.